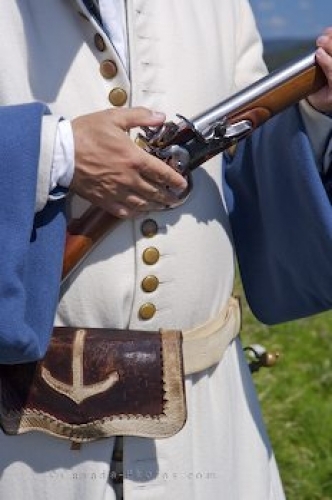 A costumed interpreter dressed as a French Private Soldier at Fort Royal at the Castle Hill National Historic Site in Newfoundland, Canada, holds onto a gun used during the war. At Fort Royal at the Castle Hill National Historic Site near Placentia on the Avalon Peninsula in Newfoundland, a man dressed as a French Private Soldier holds onto an old war gun. This gun is also called a musket and is a long gun which was intended to be fired from the shoulder and one which took a long time to reload making it a problem during war. This type of gun was eventually replaced with more accurate and powerful ones and today, people can find modern replicas of these guns which are mainly used by historical interpreters, hobbyists and a few hunters. Visitors to Fort Royal can tour through the reconstructed French Navy base at Castle Hill National Historic Site and learn of the wars which took place here in early years. Established in 1662, people such as this French Private Soldier would watch over any signs of war approaching from New France. Costumed interpreters play their roles and re-enact life as it was when a colony was trying to be made at Placentia by the French people. Picture of a French Private Soldier holding a war gun at Fort Royal, Newfoundland. A costumed interpreter dressed as a French Private Soldier (ca 1690) with a smooth war musket at the remains of Fort Royal, Castle Hill National Historic Site, near Placentia, Placentia Bay, Highway 100, The Cape Shore, Avalon Peninsula, Newfoundland, Newfoundland Labrador, Canada.